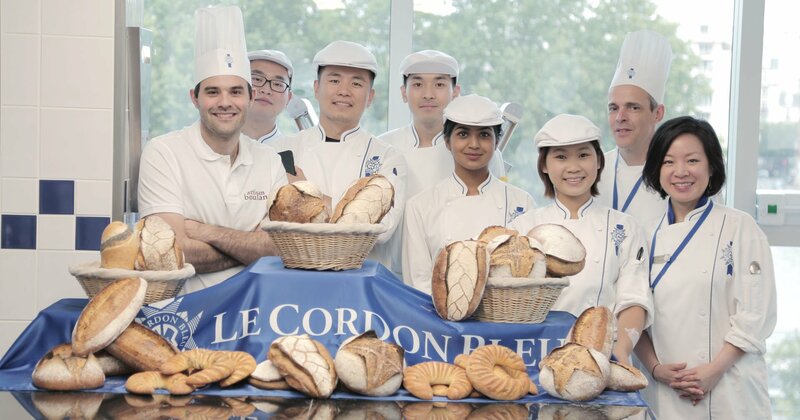 We were pleased to welcome Chef Guillaume Felez to Le Cordon Bleu Paris Institute for a practical boulangerie class. Guillaume Felez maintains strong ties with the institute Le Cordon Bleu Paris. He has actually met every single class since the creation of the Boulangerie Diploma in 2015. He also accompanied Chef Olivier Boudot and the students to the Europain trade show in 2014 and is now part of the examining jury for the boulangerie students. Originally from the Gard region of France, Guillaume Ferez discovered his passion: baking. He started to engage in internships from a very early age, to learn the tricks of the trade. His most remarkable experience was his meeting with Mr Zunic, a boulangerie chef from the Rheims region who would instil him with good work ethics and also pass on knowledge and passion. A year later he decided to settle in Arles in the Bouches-du-Rhône region where he was in charge of managing a bakery for a year. Keen to widen his horizons, Chef Felez decided to practise his profession in other areas of the world, firstly in Norway where he specialised in working with leaven and seeds. He then moved to Korea where he learnt the technical nature of working with Asian produce. When he returned to France in 2012 after several years of working with skilled chefs, Guillaume Felez was hired by Kayser where he acquired all the necessary experience to become an excellent baker. He was then called to a new project in the 14th arrondissement of Paris: the opening of a new bakery, ‘Pains et Gourmandises’. Guillaume Felez has been working for Moulin Bourgeois since June 2016 as a baking instructor.